A professional writing retreat opens up new opportunities for teacher leadership at local sites, allowing teacher-consultants with writing and editing experience to come to the fore. We suggest putting together a small leadership team that includes the retreat facilitators themselves, whoever will be responsible for the logistics and administrative details of the retreat, and other interested teacher-consultants as needed. 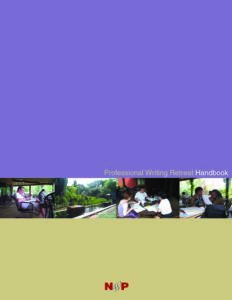 Strong facilitators include teacher-consultants who have an interest in and commitment to moving professional pieces to publication and who have solid experience in working with writing groups or in supporting others in their writing. We also suggest that at least one person on the team have some experience as a leader at your site.